I peer down from the top of a windswept cliff, 30 feet below into clear turquoise water. The air is warm. The sky, a cloudless blue. My uncle’s family is far away, back at the cottage they’ve rented at this beach town on the southern coast of Sicily. There’s a flat half-circle bit of stone jutting out from the bottom of the cliff, just where the rock hits the water. The waves pour over it, spreading slimy green seaweed back toward the cliff, filling ancient little crevices with salt and spray. It’s the perfect spot for jumping into the ocean. But how to get down? I take off my shoes, hoist my backpack onto my shoulders and start the descent, feet first. There are sharp stones and prehistoric clamshells jutting out from the rock face, making perfect steps for my feet, ideal holds for my fingers. I’m down in a matter of minutes, a little sweaty, my arms and legs rubbery. Backpack safely tucked into a shallow hole in the cliffside, I dive into the water and am shocked at how cold it is. The transition from hot skin to cool water turns icy in an instant. I swim out a distance before heading back to the cliff. It’s too cold to sit in the shade of the cliff and I need the sun. But how to get up? Backpack on my shoulders again, the ascent takes longer, and I’m puffed out and gasping for air by the time I get to the top. Slipping on my shoes, I realize I have an audience. A group of boys, 10 or 12 years old, half my age, watch me as I catch my breath and head back along the cliffside path down to the beach and the cottages. 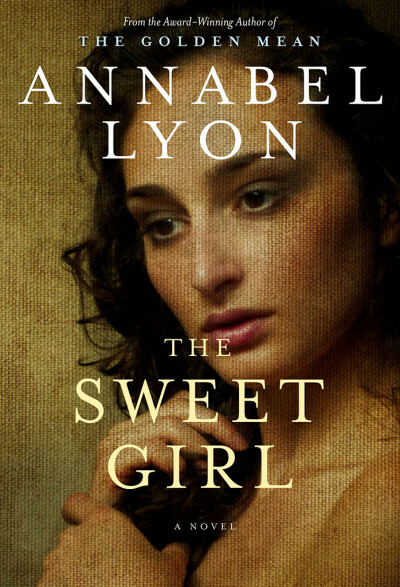 Annabel Lyon’s The Sweet Girl (amazon.ca / amazon.com), is a story that takes place by the sea. Pythias, daughter of Aristotle, grows up in an environment I would have loved. Surrounded by books and the sea, she can read all morning and swim all afternoon. Because her father is curious above all else, he raises Pythias without the restrictions that all other girls and women of her time would have been tethered by. Aristotle teaches his daughter to swim – one of the most beautiful book passages I’ve ever read – to read, to reason and to dream. He teaches her that everything is possible, that she can achieve anything. Without Aristotle to protect her, where will she go? And how will she get there? The decisions are hers. A situation almost unheard of for an honourable woman in Ancient Greece. There are other girls and women in the story who lead similarly unfettered lives: a goddess, a courtesan, a midwife. Three strong female characters from whom Pythias learns how to navigate her life as a woman alone. She has skills, intellect and grace thanks to her father and the wisdom of formidable women. But will she be able to hold onto each of these gifts on her own? The question is posed again and again throughout the book and by the end, I was happy that Pythias continued in her father’s footsteps. That she was courageous in the face of tradition that would have her governed by a man – any man – rather than live her life on her own terms. Fearless when confronted by difficult choices like what to do when your servants rob you blind in your own home. Curious in the pursuit of love – with the unexpected, untrustworthy Myrmex, the expected, honourable Nicanor, or the decadent, love-mad Dionysus. Adamant against those who would turn her against herself, her father, her ability to swim all by herself. Annabel Lyon’s writing is gorgeous. More than just a great story with a fascinating group of characters, Lyon’s perspective on humanity, on our capacity for courage, fearlessness, curiosity and conviction, weave through the book in every beautifully constructed passage, every stunning scene. Mixing magic with the mundane, Lyon has drawn an evocative and indelible image of what it’s like to be Aristotle’s daughter. What it’s like to live a life unfettered. To plunge into the sea and rise to the surface, breathless and alive. All on your own.